Dear Parishioners: On Saturday morning, Father Connors and I attended the Ordination of our new Deacons. Three young men, Steven Battey, Joseph Brice and OLM’s Brian Morris were ordained as Transitional Deacons for the Church of Providence by Bishop Evans. We wish them our prayerful best wishes and heartfelt congratulations! We celebrate the great Solemnity of Corpus Christi this weekend. 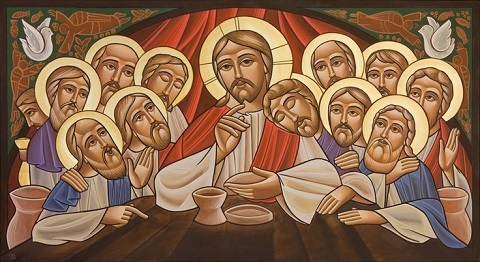 It is a feast in which we renew and rededicate ourselves to the real presence of Jesus Christ in the Eucharist. Pope Emeritus Benedict XV in a homily on this feast reminds us of its great importance in the life of the Church and in the life of every Catholic. This Corpus Christi Feast is always a good time for us to deepen our devotion to the Eucharist and renew our own commitment to dutifully attending Sunday Mass. We might ask ourselves, how important is Sunday Mass each week in our lives? Do we skip it casually out of indifference or apathy? Do we strive to faithfully attend Sunday Mass even when traveling or away on holiday? The Eucharist is truly the source and summit of our faith as Catholics so it must always be central in our lives. The worship and praise of God at Sunday Mass should be the highlight of our week not just something we do out of mere obligation or habit. Yet often we take Mass for granted. We are truly blessed to be a parish that offers a full schedule of Masses and live in a nation where we can come to Mass freely and without fear. Many Catholics in our world often have limited opportunities to have Sunday Mass due lack of priests, great distance or remote locations. Many other Catholics courageously face violence or terror in practicing their faith. Sunday Mass is a real blessing and a true privilege for us. Yet do we truly act as if it is? Do we arrive to Mass early to pray and prepare spiritually or do we simply rush in at the last moment or casually arrive late? Do we dress as if we are going to a banquet with God or are we dressed for the beach or golf course? Do we recite the prayers with faith and joy or mumble through them? Do we join in the joyful singing of hymns? Such a review is good for all of us to conduct from time to time. Whether priest or laity we always need to strive to deepen our devotion to the Eucharist with prayer and proper reverence. But we also need to show our deep devotion by making Sunday Mass truly central in our faith lives and the highlight of our week. Corpus Christi is a time when we Catholics offer our total love and commitment for Christ in the Real Presence by honoring Him in a very public way. We do this with our Corpus Christi Procession of the Eucharist. Together we carry Christ truly present in the Eucharist to the world outside with praise, thanksgiving, solemnity and faith. On Monday we celebrate the important civic holiday of Memorial Day. This Federal Holiday is a time for us to remember in prayer and with thanksgiving the men and women of the armed forces who have given their lives in service to our nation. East Greenwich has a parade like many other towns. Across the nation people visit cemeteries to lay flowers, place flags and pray for the honored dead. President Ronald Reagan said of Memorial Day: “We owe our freedom to those men and women in uniform who have served this nation and its interests in time of need. We are forever indebted to those who have given their lives that we might be free.” Congratulations to our new Deacons especially Brian Morris! A Blessed Corpus Christi! Happy Memorial Day! Be well. Do Good. God Bless. Go Sox!